Blog Update: I have added a conclusion where I have provided a summary and some of my thoughts on this release. Also, this session has now been posted so feel free to take a look at it here. You can also add any comments that you have regarding this session at the bottom of this post. Key takeaway from Bala: We are innovating in BizTalk! Continue to bet on BizTalk – We will take your investments forward! What customers are telling us? How BizTalk will meet these requirements? User logs into the provisioned VM which has BizTalk installed and configured and starts using it. Wow…that was a lot of content in a short 1:15 h session. There was actually more information released related to EDI support in the EDI Services (PaaS) but I just couldn’t keep up between writing this blog and tweeting with the European BizTalk community. Cleaner integration with SharePoint. A similar statement was made with BizTalk 2010 but talking with the product team members after the presentation I know that this is not lip service. The Adapter Web Service is gone. No more installs on SharePoint servers. Also, no more consuming SharePoint’s legacy “Lists.asmx” web services. Yay! Ordered Delivery performance. It will be nice to have some improved performance while maintaining sequential integrity. Support for other sterilizers than XML (JSON, C#) - stay tuned? Overall the tone was extremely encouraging. Personally, I haven’t seen this much innovation come from the BizTalk team since BizTalk 2006 R2 when support WCF/WCF LOB adapters was introduced. Yep..I said it. The next release of BizTalk is no longer “just a platform update” . In my opinion, this is a full release and should be named accordingly. 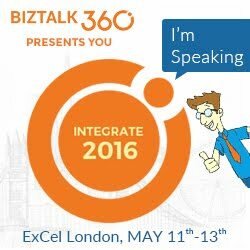 For those that think BizTalk is dead – better think again. The operation was successful and the patient is still alive. Hello Kent. Was this session at TechEd US? Excellent summary. I promise I will not tweet next time when you are in an important session. 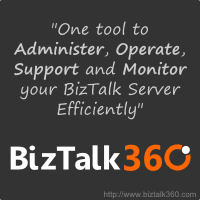 "For those that think BizTalk is dead – better think again." Statement well put. I myself said something similar two years ago (http://soa-thoughts.blogspot.nl/2010/06/biztalk-server-is-here-to-stay.html) that product will remain among us for a long time. Your post adds to that thinking and I think a lot people in community and business (those who run BizTalk in their day to day operations) will be happy. No worries Steef...i enjoyed tweeting back and forth with you guys. Can you, please, provide more information about the improvements in the ordered delivery?